I love the American tradition of having corned beef on St. Patrick’s day, and it’s one of the things I miss a lot. As you may know, St. Patrick was the patron saint of Ireland, even though he wasn’t actually Irish at all. According to legend, St. Patrick is the reason there are no snakes in Ireland—because he expelled them—or “drove” them—all out after they attacked him during a fast. This is also how it would go down at our house. Ironically enough, the Irish don’t even consider corned beef a native dish. Because beef was so expensive in Ireland, it was actually the Irish-Americans who began corning beef instead of pork. The term “corned beef” comes from the treatment of the meat with “corns” of salt. But back to the important stuff: I haven’t yet found prepared, ready-to-cook corned beef here in Switzerland. The first year I tried, I was sent from department to department to department in the largest grocery store in town because no one even understood what I wanted. “Corned beef—isn’t that in cans? That’s in canned goods.” “Oh, you want it fresh? Well, that must be by the eggs.” I was even sent to the vegetable department. After trying a couple of different stores, I decided to make my own—following a recipe that called for a beef brisket. As if this weren’t challenge enough, the Americans and Germans/Swiss happen to cut up their meat differently. Note the term brisket by the shoulder of the first diagram, then look at the second diagram. Here’s how the Americans do it. Armed with a diagram of American cuts of beef, I went to my butcher and explained that I needed this piece of beef here (pointing to the diagram). After consulting with his colleague, he decided which cut to sell to the crazy lady who wanted to cure her beef, and he also sold me the special pickling salt I needed. That was about five years ago. Since then, I’ve honed and refined my recipe and made notes to myself on the German names for the products I need. I have been able to import pickling spice. I’ve wised up and no longer tell the butcher what I want to do with my meat. And I got a large refrigerator that allows me to store the meat easily during the corning process without emptying the entire rest of my fridge of all other food. I bought a nice slab of meat during one of my mystery shopping assignments in a private shopping club for the gastro and restaurant industry. I cured it for a week. 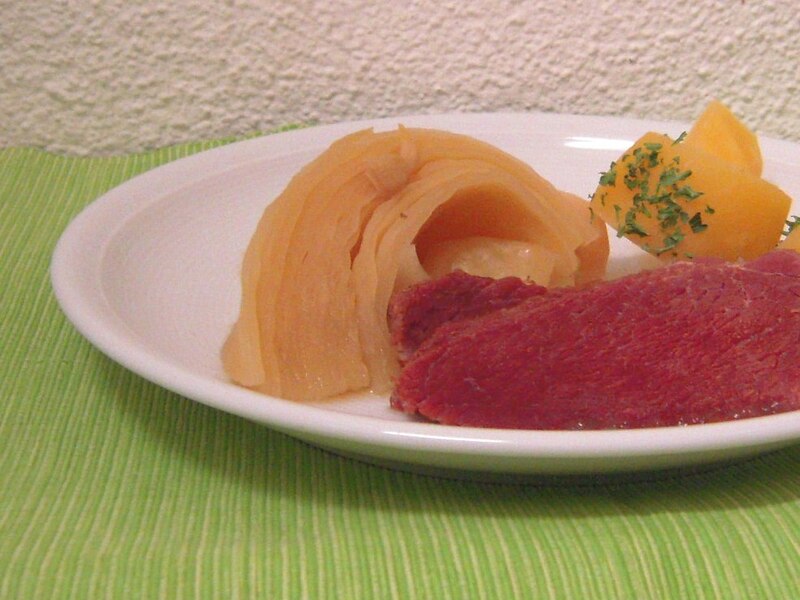 Corned beef with cabbage and potatoes. Yum. A traditional Irish-American meal for St. Patrick's day, adapted for the slow cooker. Start 72 hours to 1 week ahead. In large saucepan, heat water, salt, and sugar and stir to dissolve. Add 2 bay leaves, 8 peppercorns, 2 tsp. pickling spice, and 2 garlic cloves. Let cool slightly. Trim fat from meat. Place beef in Tupperware or other container and pour the brine over it. Make sure meat is completely immersed. If necessary, weight it down with a plate. Refrigerate no less than 72 hours, but up to 1 week. Place in large slow cooker and add bottle of beer, 2 bay leaves, 8 peppercorns, 2 tsp. pickling spice, and 2 garlic cloves. Add hot water to cover. Set slow cooker to low for 5-6 hours or until meat is tender. - Wash and peel the potatoes. Cover with water until ready for them. - Remove the outer leaves from the cabbage until the leaves are entirely light green, rinse and cut it into quarters through the spine so they stay together. Set aside. - Peel one carrot and cut it into quarters. Set aside. - Peel the onion and cut it into eighths. Set aside. - Rinse the parsley and chop up just the tops into very tiny pieces (scissors). When the meat is tender, add the potatoes on top of the brisket and onion, carrot, and cabbage on top of that. Add water to cover everything if necessary. Set slow cooker to high for 1.5-2 hours. You shouldn't undercook it and it's hard to overcook it. Remove the meat and let stand. Remove the carrot and do not serve. Place the cabbage in a serving bowl or on the tray with the meat. In a large serving bowl where you can stir the potatoes, crush the last garlic clove and rub the inside of the bowl with it. Place the potatoes in the bowl while still hot and add a handful (more is better than less) of chopped fresh parsley. Gently stir until butter is melted, it coats all the potato pieces and the parsley is evenly distributed. Serve with mustard, Irish soda bread, and beer. Prep time does not include brining time. Paleo adaptations: Substitute honey for sugar in brine, do not eat potatoes, bread, or beer. I’ve never eaten corned beef. Do you eat it raw? No. Corned beef is always eaten cooked. No, it’s boiled for several hours, usually in beer. The corned beef in the pictures above spent 9 hours in my crockpot. The corned beef in a can is precooked and ready to eat.. Your research is awesome, as are the results! Think there is something equivalent in Germany called gera¤uchertes (not rauch) fleisch but it’s not the same as the “carned” beef. What’s next? Pastrami? I could do pastrami if I could smoke this corned beef. I plan to make a DIY smoker—hopefully this summer. Has your butcher come around? I don’t tell him anymore. 🙂 And I bought this piece of meat from a different store.